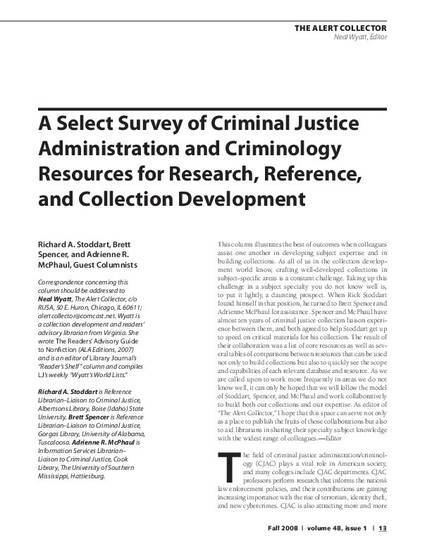 The article reviews several library resources in the field of criminal justice administration/criminology (CJAC). It examines several online subscription databases including Criminal Justice Abstracts from Sage Publications, Criminology: A Sage Full-Text Collection, and SocINDEX with Full Text from EBSCO. The article also discusses Websites including the National Criminal Justice Reference Center (NCJRS), available at www.ncjrs.gov, and books including the "Encyclopedia of Criminology," edited by Richard Wright and J. Mitchell Miller.